One of the most enjoyable discoveries I have made since we stopped buying anything packaged in plastic are shampoo soap bars. Unpackaged and made from just a few ingredients, shampoo bars are good for your hair and scalp and so easy to switch to. They can last up to three times as long as a bottle of shampoo and you’ll be amazed at the variety and quantity available. If you are worried that your hair won’t be as soft, manageable and clean, or if you are worried about colour treated hair, dandruff or a build-up of soap in your hair, then let me put your mind at rest. Since using shampoo soap bars which are mild and often hand-made with natural essential oils, I have not needed any conditioner or restorative treatments and my hair is easy to brush and very healthy. The ordinary bottle of shampoo on the supermarket shelf contains a concoction of 20+ chemical ingredients that have various levels of toxicity. Some strip your hair and scalp of natural oils (detergents SLS and SLES) whilst others coat your hair with silicon-based substances. The ill effects of chemical preservatives called parabens are relatively well known. Many of the ingredients are petroleum based and the by-products from the production of fragrances include dioxin and formaldehyde. There are many organic shampoos on the market but they all seem to be bottled in plastic. It never seizes to amaze me that the purest of ingredients imaginable are nevertheless packaged in plastic. There is an anti-shampoo movement out there called ‘no poo’ whose members advocate washing hair with bicarbonate of soda and apple cider vinegar. But I love using shampoo bars because it allows me to carry on with the daily ritual of washing my hair with something that smells good and makes lots of bubbles. What’s really in your shampoo? Where do all the shampoo bottles go? This entry was posted in Bathroom and Cosmetics, Getting started and tagged shampoo bars, shampoo soap, unpackaged shampoo on December 18, 2016 by admin. Thanks for your comment, Dominika. Some other readers made similar observations about Lush. I have edited the post and changed the picture to show the truly ‘natural’ soaps from One Village and from Natural Soap in Norfolk. Hi Julie, thanks for getting in touch. I love the look of your products and your beautiful website! How wonderful to have these products grown and produced locally! Brilliant. Exactly what I have been looking for! 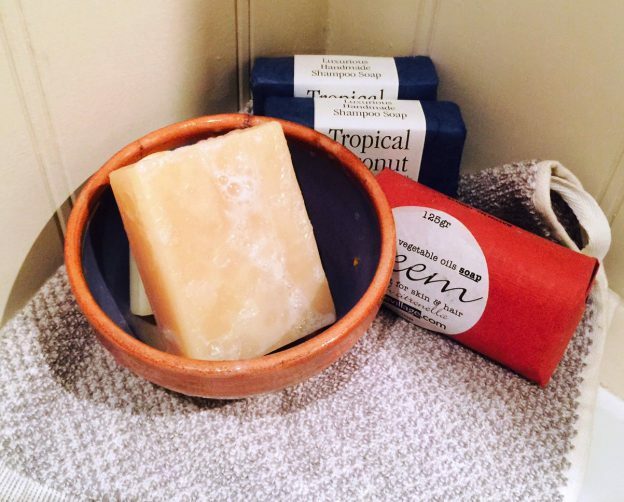 I have just bought some shampoo bar soap from the Natural Soap company but have noted that it contains Palm oil – difficult! Thanks so much for such a lovely blog post! Taking my first step away from bottled shampoo and this was so helpful to have some lovely UK companies to look at. Have gone for Wild Sage so fingers crossed! Can you tell me the bar that you found lasts the longest?